A diverse mixture of harmonies, messages and instruments. Calm in the Chaos is from the heart. Someone’s Sister’s rare blend of rich harmonies and vocal expression have taken them from NC to their interview with NPR’s “All Things Considered” and to the stages of \"Eddie\'s Attic\" in Atlanta and New York’s, “The Bitter End”. Curve Magazine says, \"Georgia Winfree and Katherine Jones, the singer-songwriters who make up Someones Sister, draw many comparisons (like k.d. lang and Patsy Cline) but trust us: These wailing chicks proved on their recent debut, Hand Me Downs, that theyre in a class of their own.\" For those who like to know their listening moments are well spent, all proceeds from their music go to creating a foundation for the prevention of child abuse. 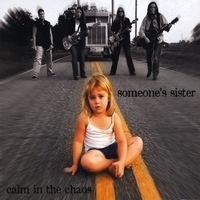 On their second CD, \"Calm in the Chaos\" the song \"Because They\'re Out There\" is dedicated to those survivors. Someone\'s Sister sings in your honor. Another incredible CD that I will be adding to my collection! \"Because They\'re Out There\" is my favorite track. Keep singing for those who need or haven\'t found their voice yet!!!!!!!!!!!!! No way to limit music created from the heart. In a world that is so busy seeking something for itself, this band is all about the LOVE. Oh Love and Father are two of my Favs because I love their harmony. You have to see them live to really feel the intensity of this band. Someone\'s Sister has produced an excellent sophomore effort. Georgia Winfree\'s vocals rival Amy Ray\'s of Indigo Girls for their emotional wallop. \"Virginia\" & \"Fairytale Life\" are two of my favorites. The CD is consistently good from start to finish. If \"Because They\'re Out There\" doesn\'t bring a tear to your eye or make you angry or both at the same time, I\'d be surprised. This band is particularly committed to fighting child abuse. They do it well. Great stuff! These woman, this band share music and emotions with talent and class. The harmony and timing is excellent and entertaining. From Free to Father your heart soars and you feel the emotion and you don't want them to stop playing..........Here them live and it triples your feeling that this band, all inclusive is...............so amazing!